If you live in Marietta and have noticed homes with small devices installed high on their walls in lieu of an air duct system, you may be wondering why some people choose this type of air conditioning. The short answer is that they’re cheap and convenient. Here are some of the points we believe you should consider before choosing what type of air conditioning to invest in. 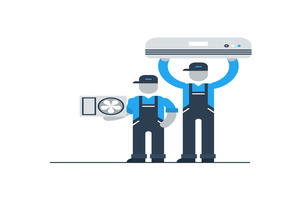 If you have ever had traditional air conditioning installed in your home, you know it can be a lengthy process, taking a week or more. Ductless units, on the other hand, can be finished in as little as a day. Not only that, but the cost is much lower than the competition, mainly since there are fewer materials and less labor involved in the installation process. Besides installation costs, you’ll also be saving on monthly bills, since these units only target specific zones and don’t try to pump air to unused areas of your home. Because of this energy efficiency, ductless units also help you reduce your carbon footprint. The compact size of the air conditioning unit means that this system is ideal for apartments, dorms, and other spaces where there’s not a lot of room to spare. If you have a larger home, you can also use one of these units to increase air circulation in a basement, attic, or any other room where you don’t get a lot of air flow. Because they are used for small spaces, these units are typically quick and easy to adjust by remote control, so that you don’t even have to get up from wherever you are relaxing. No machinery is silent, and ductless air conditioning is no exception. Usually it only gives off a quiet hum, which most people find preferable to the heavy clunk of traditional air conditioning. You can easily ignore ductless units, especially if you are talking or have the television on, whereas noisier air ducts tend to drown out other noises.